The “Gettysburg Gun” belonged to Battery B, 1st Rhode Island Artillery. 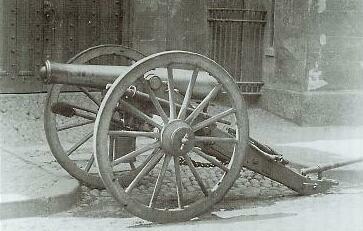 An artillery projectile was stuck in its muzzle on July 3, 1863. This view was taken circa 1890. In part one of our artillery series we featured a Napoleon manufactured by Quimby and Robinson in Memphis, Tennessee, and a 10-pounder Parrott Rifle, manufactured by the West Point Foundry in Cold Spring, New York. 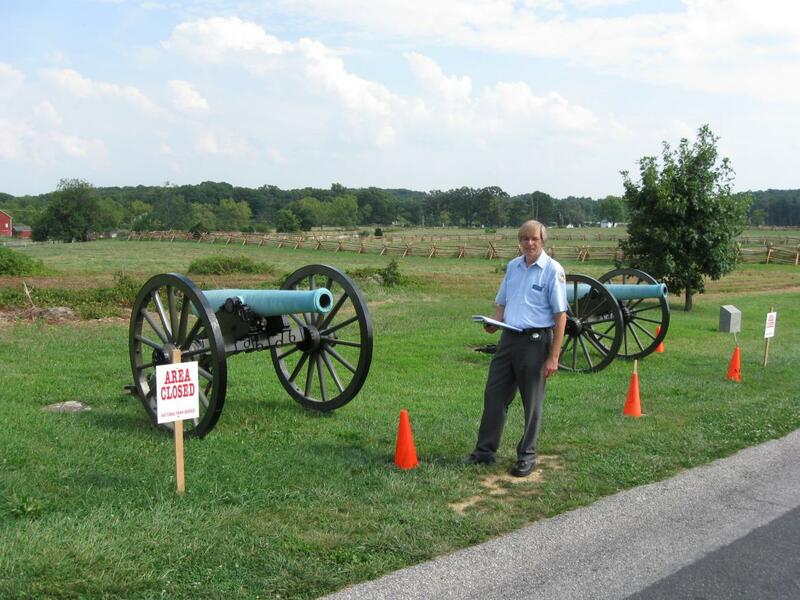 In our fourth post, George Newton showed us the artillery pieces used on headquarters markers, and the two monuments on East Cemetery Hill to Cooper’s Battery B, 1st Pennsylvania. 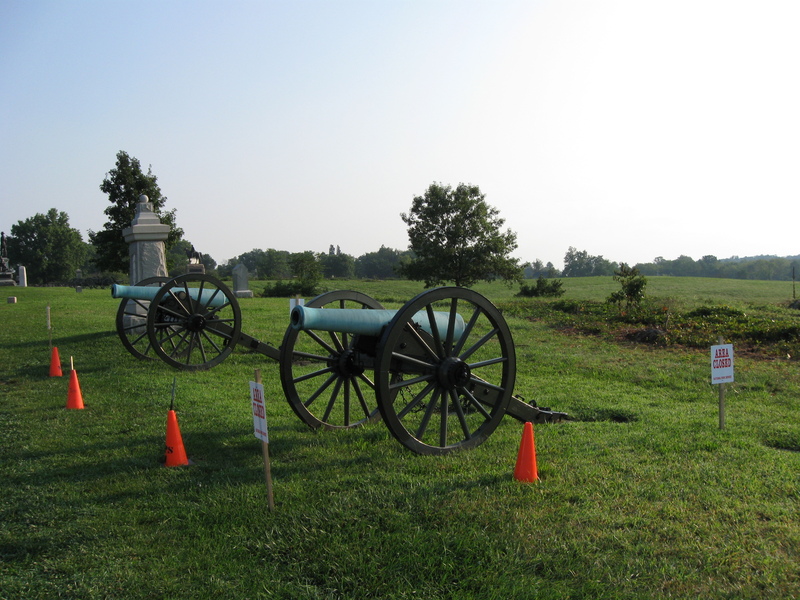 In our fifth post on artillery, George presents the highest numbered 3-inch Ordnance Rifle at Gettysburg National Military Park, and the positions of the artillery pieces today representing Cooper’s Battery and Rickett’s Battery. 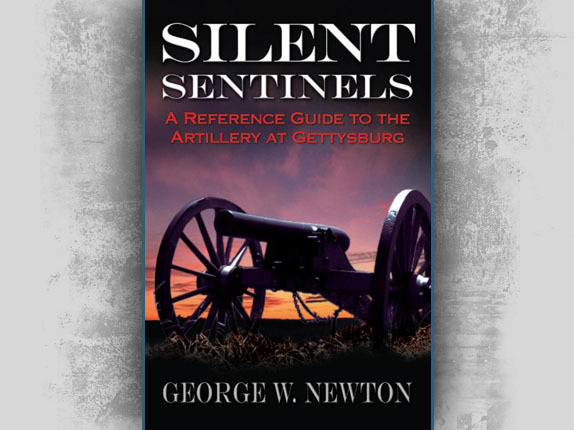 In our sixth post, Gettysburg Licensed Battlefield Guide George Newton explained the advantages of 3-inch ordnance rifles, and the artillery bombardment involving East Cemetery Hill on July 2, 1863. In our seventh post, Licensed Battlefield Guide George Newton shows us the British-made Whitworths, and explains how they were loaded, and their advantages and disadvantages. In our eighth artillery post, George Newton presented a 12-pounder Napoleon at Dilger’s Ohio Battery on West Howard Avenue. 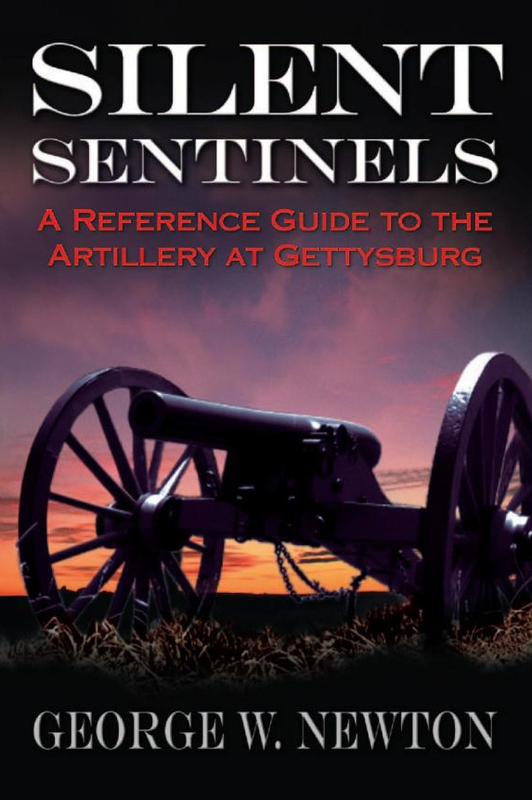 In the ninth artillery post, Gettysburg Licensed Battlefield Guide George Newton showed us limbers, caissons, and their proper positions when a battery was deployed on the battlefield. 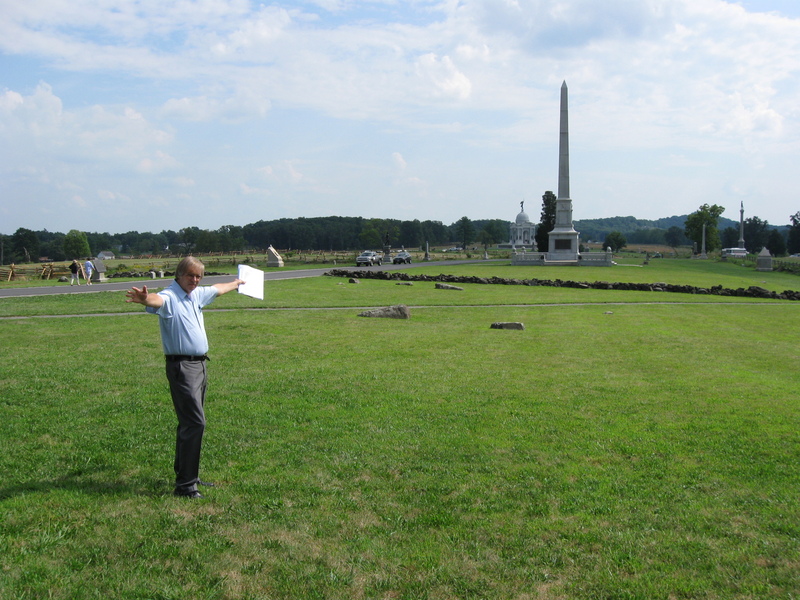 In today’s post, Gettysburg Licensed Battlefield Guide George Newton shows us the position of Battery B, 1st Rhode Island Light Artillery (Brown’s Battery) on July 2, 1863 and July 3, 1863. 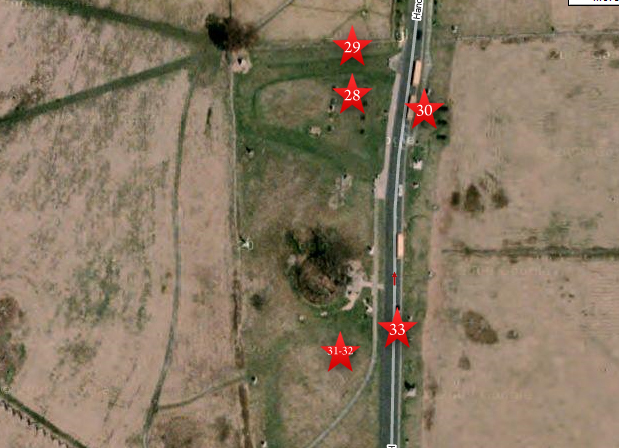 This map shows the locations of the videos that we shot on Oak Hill. Videos #1-#27 were presented in our previous artillery posts. Video #28 was taken by a limber of Cushing’s Battery. Video #29 was taken by the limber to Cushing’s Battery and by the stone wall that connected the inner and outer angles in the “High Water Mark” area. Video #30 was taken by a limber of Cushing’s Battery and by a caisson on the other (east) side of Hancock Avenue. 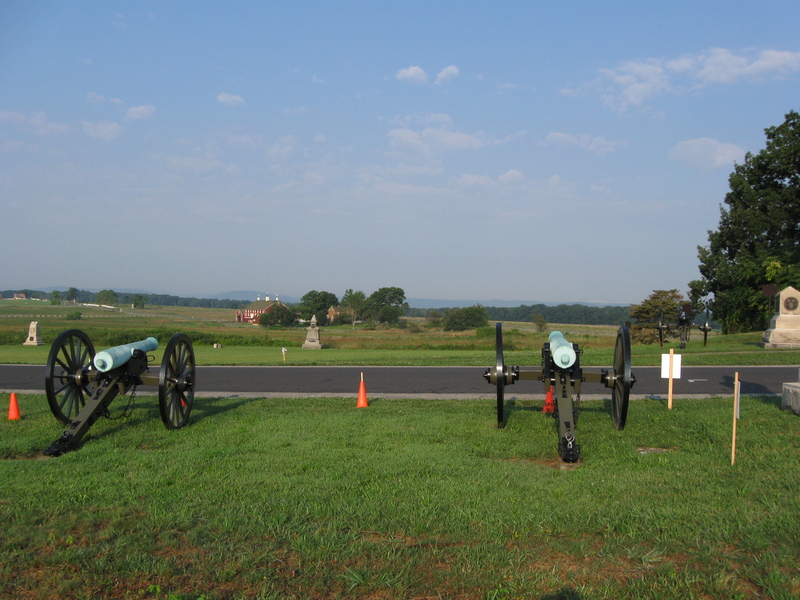 Videos #31 and #32 were taken by the position of Brown’s Battery on July 3, 1863. Video #33 was taken by the monument to Brown’s Battery. This map was created facing north at approximately 7:00 PM on Monday, August 24, 2009. 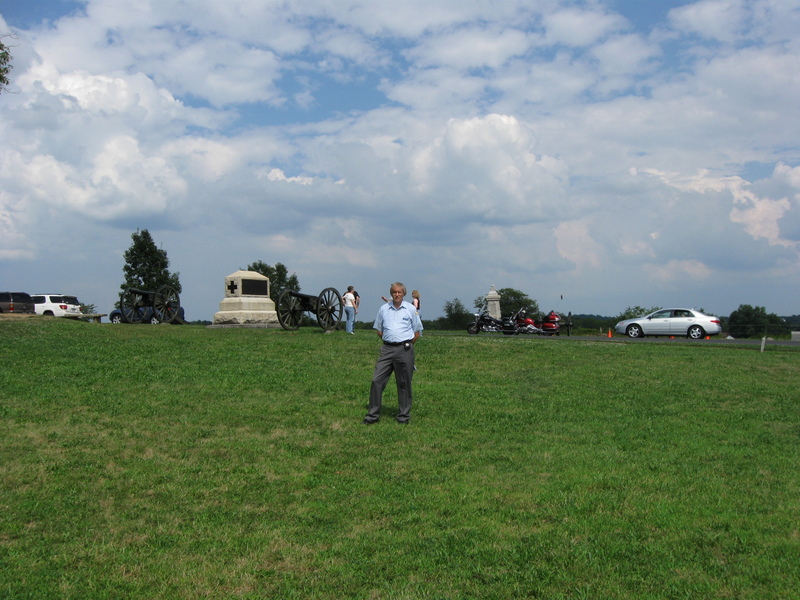 Gettysburg Licensed Battlefield Guide George Newton is standing in the position occupied by Brown’s Battery (Battery B, 1st Rhode Island Artillery) on July 3, 1863. The monument for Brown’s Battery is behind (east of) George behind the motorcycles. This view was taken facing east at approximately 3:30 PM on Sunday, August 23, 2009. In Video #31 (Videos #1-#30 were shown in our previous Artillery posts) Gettysburg Licensed Battlefield Guide George Newton is on Cemetery Ridge at the position of Battery B, First Rhode Island Artillery (Brown’s Battery). He shows us the position actually occupied by Brown on July 2nd and how they were pushed back through “Brown’s Gate.” This view was taken facing east to southwest to northwest to southwest at approximately 3:30 PM on Sunday, August 23, 2009. 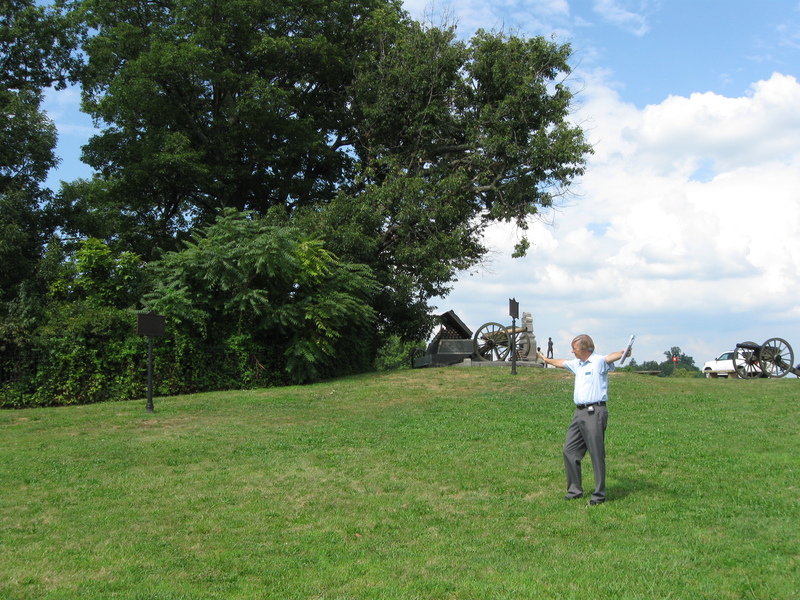 George shows us that Brown’s Battery position was located west of Hancock Avenue on Cemetery Ridge. It stretched from the Copse of Trees to the north… This view was taken facing northeast at approximately 3:30 PM on Sunday, August 23, 2009. …to the area of the first stone wall to the south. This view was taken facing southeast at approximately 3:30 PM on Sunday, August 23, 2009. In Video #32 Licensed Battlefield Guide George Newton is on Cemetery Ridge at the position of Battery B, First Rhode Island Artillery (Brown’s Battery). He shows us the position actually occupied by Brown on July 2nd and how they fell back to Cemetery Ridge. He also shows us how their caissons will be on the other (east) side of Cemetery Ridge for protection. This view was taken facing southwest to east at approximately 3:30 PM on Sunday, August 23, 2009. Although the position of Battery B, 1st Rhode Island Light Artillery was located west of what is now Hancock Avenue, Brown’s Monument position is now located east of Hancock Avenue. This view was taken facing northeast at approximately 8:00 AM on Sunday, August 23, 2009. On July 2, 1863, Brown was ordered forward to a rise of ground between the location of the 59th New York monument (center background) and the Codori Farm (red barn in the background). This view was taken facing southwest at approximately 8:00 AM on Sunday, August 23, 2009. 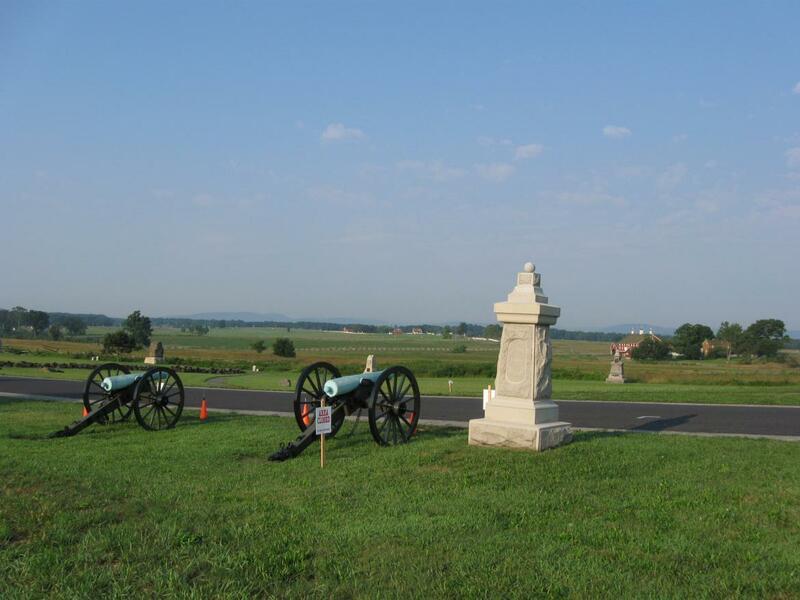 Brown’s monument is located to the right (north) of the two artillery pieces now on display. This view was taken facing southwest at approximately 8:00 AM on Sunday, August 23, 2009. 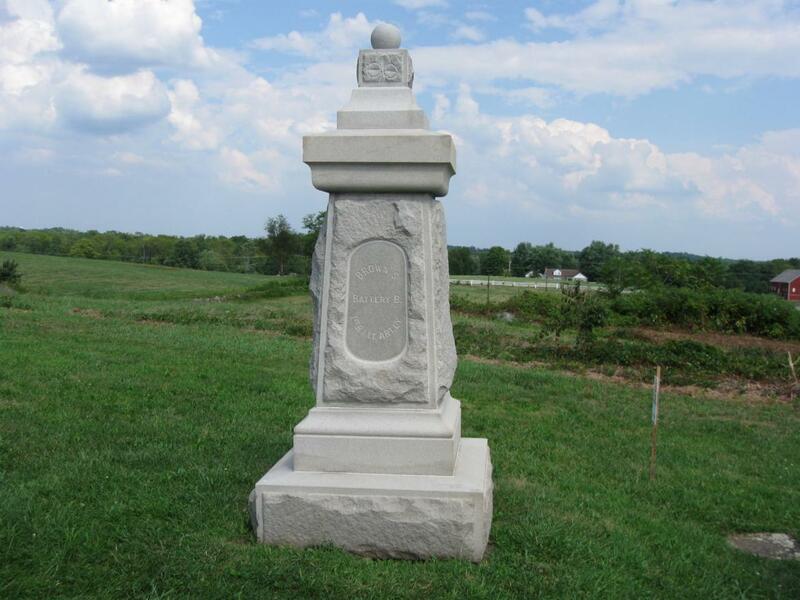 During the Battle of Gettysburg, Brown’s Rhode Island Battery had 7 killed, 19 wounded and 2 missing. This view was taken facing east at approximately 3:30 PM on Sunday, August 23, 2009. Licensed Battlefield Guide George Newton is now standing by the artillery pieces designating the position of Brown’s Battery, except that they are east of Hancock Avenue. The carriages are being repainted, so we can not stand as close to them as we would like. This view was taken facing southeast at approximately 3:30 PM on Sunday, August 23, 2009. In Video #33 George Newton is on Cemetery Ridge at the position of Battery B, First Rhode Island Artillery (Brown’s Battery). He describes how a cannonball became stuck in the muzzle of one of the guns of this battery on July 3, 1863. Brown also had four guns on July 3, 1863. This view was taken facing east to northeast to north at approximately 3:30 PM on Sunday, August 23, 2009. 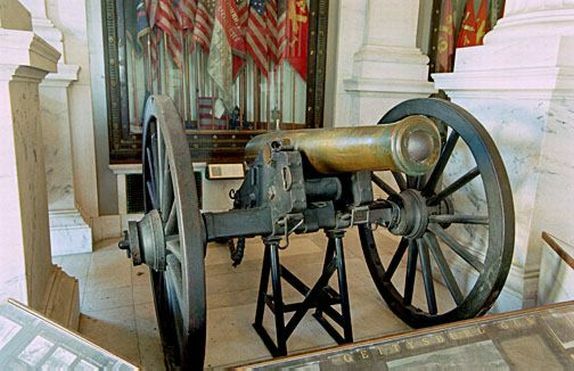 The gun with the artillery projectile stuck in its muzzle, now known as the “Gettysburg Gun” is on display at the Rhode Island State House. It is sitting on its original carriage. This view is courtesy of the State of Rhode Island. Here is a closer view of the muzzle with the dent, and the inscription now on the gun. This view is courtesy of the State of Rhode Island. 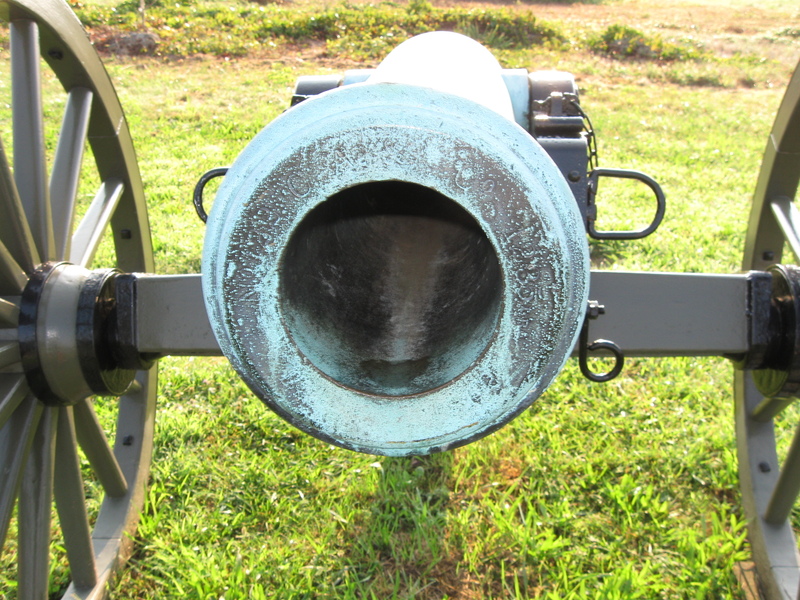 This is the muzzle of the artillery piece that George showed us in the previous video. This view was taken facing east at approximately 8:00 AM on Sunday, August 23, 2009.